Genuine, antique horse and ox drawn carts for rental. Fully functional or for static props. Our heavy horse / ox cart dates from the 17th century to the late 19th century. Can be harnassed to a team of oxen, horses or mules. Removable tailgate and optional drivers seat. Has original tilt/dump body, (mortised and wood pegged fittings), but open stake body is available. Iron tyres nearly 4 inches across. Fully functional antique in excellent condition. 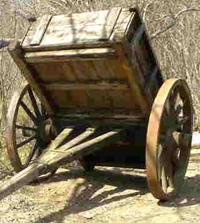 Our genuine antique wagon dates from the 18th century to the early 20th century. Can be geared up for a single horse or a team with either single pole or shalves. Optional drivers seat with this body. Optional coach body available soon on this unit. Wagon frame length is adjustable and various body styles can be installed. Very versatile wagon for many uses. Single seat deluxe horse buggy, (Doctors Buggy). Earlier model with iron tyres on wood wheels. Shalves for single horse included. Popular from the 1840's to the early 1900's. Single seat, but could accommodate an extra seat if required. Mid 19th century to early 1900's. Iron tyres on wood wheels. Original antique will make a great static prop. 17th century to early 1900's. Early model with wheels pinned to axles. Specializing in wood construction, concrete, & some metal. Stake body with seat & iron tyres over wood wheels.